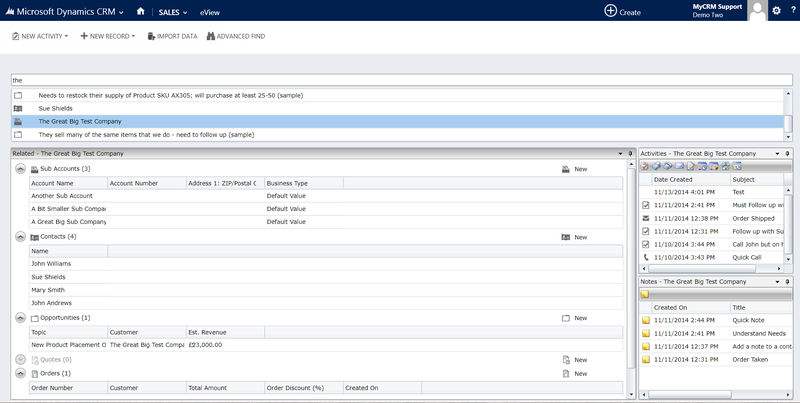 MyCRM Blog | Connecting related records in a 360 Degree eView of your Customer, in Microsoft CRM 2013. 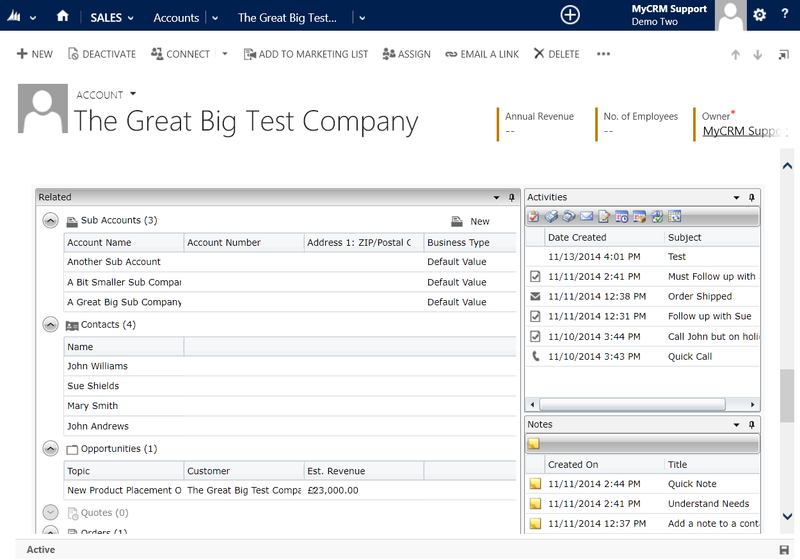 Connecting related records in a 360 Degree eView of your Customer, in Microsoft CRM 2013. One of the key factors of delivering or implementing a CRM strategy in a business, is to understand that placing your customer at the heart of your businesses, is the main objective of the exercise. Some, probably most executives or marketing and sales directors (me included), may argue that the purpose of CRM is to create more profit from sales etc. but the sword is double edged. The CRM strategy should deliver more sales, but on the flip side it should improve customer service and customer loyalty too, creating a well organised efficient business. Research has shown that efficiency and therefore profit can come from streamlined business systems, but having a strategy that helps create great customer service will create happy customers. Happy customers become loyal to your service and product, and let’s face it we all like to be treated well or experience great service. Many times I have seen business specialists and self-appointed guru’s babble on about this, that or the other, being the biggest asset to your business, but surely that’s your customer right? Then again as a CRM provider or product and service provider: do we believe this, just to sell product and does it actually matter? Well let’s think about that for a moment, because a business needs customers. Building a customer base is never easy, but by having all the information at hand to help a customer and deliver a great experience has to help. I would have to argue that it is your loyal customers that are the lynch pin that makes your potential business grow, and after working with many businesses over the past 20 years I would agree that centralised shared data about your customers is a huge asset. But enough of all of what’s right and what’s wrong, it’s your business at the end of the day. Today I want to share some information about one of the software components from MyCRM, which can help your organisation realise some of the key successes in recognising the importance of well organised and structured customer data. In this post we are looking at the latest iteration of the MyCRM eView product, which will help deliver a true 360 degree view of all information held about a single customer, and the organisational structure it is part of. Our eView solution was first released for CRM 2011, and gave the option of enabling a single view of all related data about a customer. You can easily see from the screen shot below that this could be very useful when trying to get a snap shot of what was happening with any one customer on your CRM. The eView solution is a unique tool set, which helps end users visualise and understand all data that is related to an individual contact or organisation, with related contacts. The eView solution has gone through many iterations to improve performance and customisation features, and to make the data returned relevant to the end user at your business. With the new modern design of Microsoft Dynamics CRM 2013, eView has been upgraded to work perfectly as an add-on solution in the new environment. 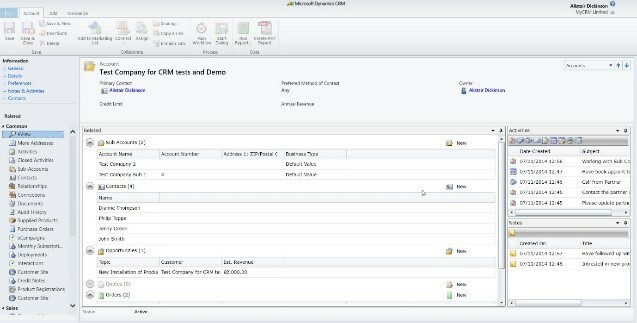 Furthermore, all the great features that eView brings to CRM when displaying a single view of the customer, is now incorporate at the record level with CRM 2013. From the eView window you can access all related data, but also quickly and easily create new context related records without leaving the single view. Which means it has never been easier to work with a single record, and create related and activity records directly in CRM. Below is our new video demonstration of eView, and you can see for yourself the advantages a single view brings to end users when using Microsoft CRM 2013. Here at my CRM we offer our customers http://www.mycrmgroup.com/customers.aspx the best solutions to help them drive business forward and gain real benefits from implementing Microsoft Dynamics CRM. We are in our 5th year of trading as a business and have seen incremental growth year on year in profits, our team are based in the Isle of Wight, UK and we maintain relationships with customers in 26 countries.